larswm-7.5.3.tar.gz Stable, released July 15, 2004.
larswm-7.5.3-1.EL4.i386.rpm i386 RPM for Enterprise Linux 4.
larswm-7.5.3-1.EL4.src.rpm SRPM for Enterprise Linux 4.
larswm-7.5.3-1.rhfc4.i386.rpm i386 RPM for Fedora Core 4.
larswm-7.5.3-1.rhfc4.src.rpm SRPM for Fedora Core 4.
larswm.pdf Manual in portable document format. 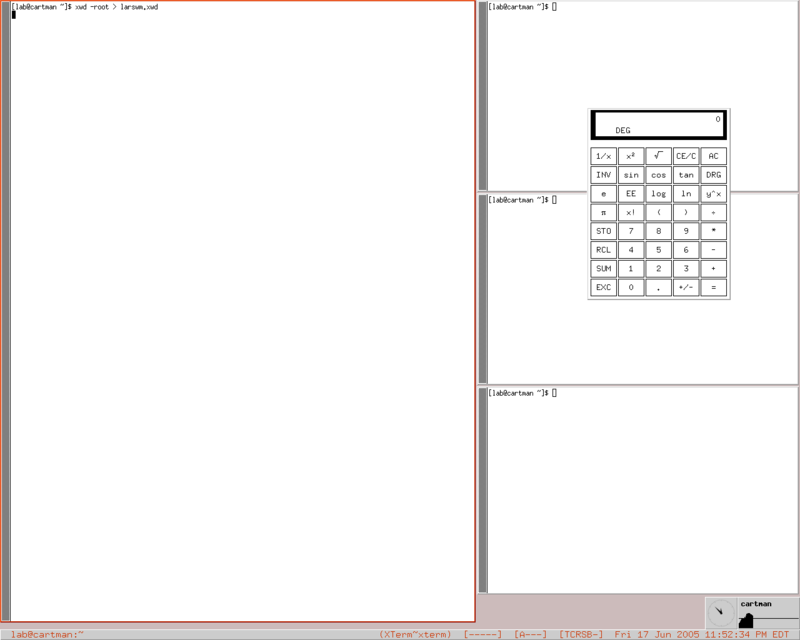 larswm_ss.png larswm running with defaults from the Fedora Core 4 RPM. larswm-devel This is where discussions related to larswm development takes place. If you are interested in testing the latest versions before they are posted here, this is where you want to sign up. freshmeat.net New stable releases are announced on freshmeat. If you are interested in being notified whenever a new stable release is available, you might want to subscribe to the larswm project there. Debian stable Edelhard Becker maintains the Debian package for larswm, and he has set up a separate page for packages for the current stable release. Unstable and testing can be downloaded from the Debian distribution servers. KNOPPIX The run-from-CD linux distribution KNOPPIX contains larswm. To use it, add desktop=larswm to the boot options. larsbiff Björn Johannesson's enhanced larsclock that adds email notification on the status bar. larswmrc M4 macros Christopher Biggs has created some M4 macros that automatically numbers the resources in larswmrc. Xinerama support Florian Forster's patch that adds support for Xinerama when using multiple screens. Contact lab at fnurt.net for more information!